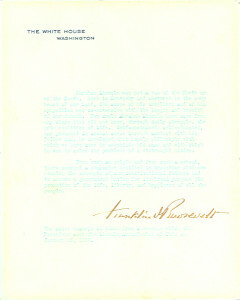 Presidential autographs, signatures, signed letters, and signed documents of all presidents of the United States are not as rare as most people believe. 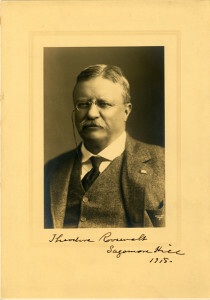 The only true rarities are of those who died in office, and they are rare only in autograph signatures and signed documents created while serving as president. The more famous the president, the more likely that he had a career during which he signed many autograph pieces, letters and documents. Also, the more important the presidency, and the better known a president was afterwards, the greater the likelihood that his autograph signatures, signed letters, and signed documents would be saved and treasured by later generations. 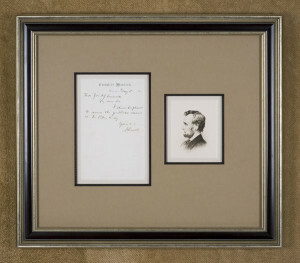 The number of autographed pieces created, however, does not translate into lower values among the most famous presidents. The demand for their signed pieces is such that, despite the number of signed letters and signed documents created, their values remain relatively high. 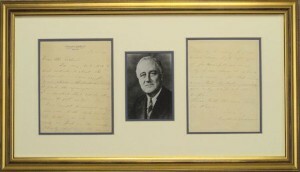 The less well-known presidents are in demand only by collectors forming complete sets of presidential autographs, signatures, signed letters, and signed documents. George Washington signed many documents as the first president, and also signed many Army discharge documents at the end of the American Revolution. He has always been in great popular demand, and values reflect this. John Adams, who was a highly accomplished early statesman in many roles, as well as president, is far less common in signed letters and signed documents than his contemporaries, and his values are commensurate with the scarcity of his signed documents. Thomas Jefferson had a lifelong public career, beginning with the governorship of Virginia and ending with the presidency. 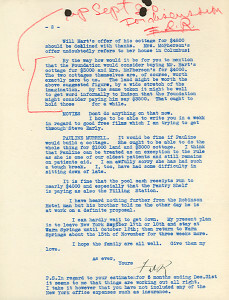 He produced many signed documents, as well as signed letters, but the latter have been heavily collected by institutional libraries, notably the University of Virginia, which he founded, and they are not frequently encountered. 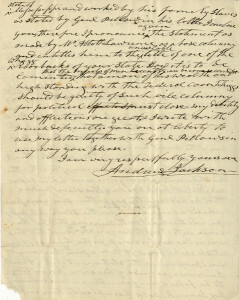 Andrew Jackson had an important military career before becoming president, but did not sign all that many documents that have survived; he is much more available in signed documents as president. 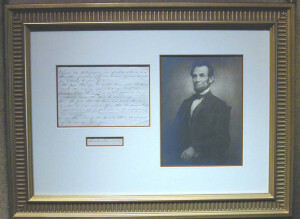 Abraham Lincoln is the most popular president among collectors of autograph signatures, signed letters, and signed documents. 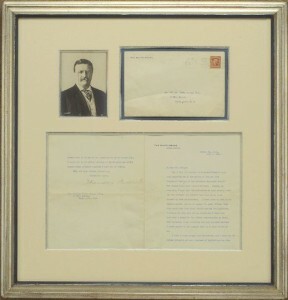 Despite the fact he was assassinated, he is available to collectors because he signed many presidential documents during his four years as president. 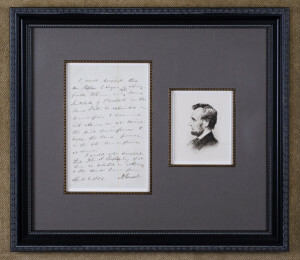 Everything signed by Lincoln has been treasured and in demand since 1865. 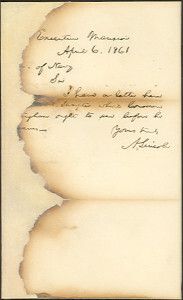 As a military leader, Ulysses S. Grant was required to sign many documents, and after the Civil War, he signed many cards with his autograph signature. Also during this period, he wrote and signed letters which were also saved, as his name was synonymous with winning the Civil War. 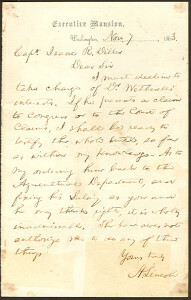 Presidential documents were also treasured and are available today to collectors of both Civil War leaders and presidents. Theodore Roosevelt had a long career in many different capacities, several of which required him to sign letters and documents, and he was well-known enough throughout the country that his signed pieces were saved. 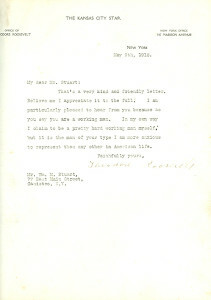 Franklin D. Roosevelt, our longest-serving president, signed a large number of letters as president, though not very many documents, and the recipients of his letters always preserved them. Harry Truman‘s common sense approach to being a president, and the very important decisions he had to make, ranging from dropping the atomic bomb on Japan to the conducting of the Korean War, have ranked him as one of the best presidents. 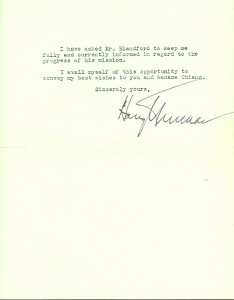 After his presidency, Truman was happy to autograph photographs, sign books and sign letters for those who wrote to him, and he is one of the most available of all of the important presidents. Dwight Eisenhower is of great appeal as the World War II general, and increasingly in demand as president. 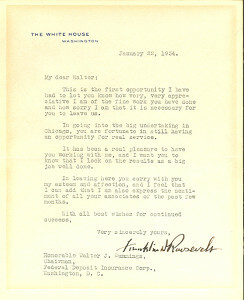 In both roles, he signed many pieces, though his World War II autograph signatures, signed letters, and signed documents are much less common than his presidential ones. John F. Kennedy established a policy of not signing most of his letters when he was congressman, senator, and then president. 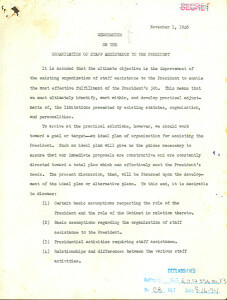 He designated secretaries to sign almost everything that was not signed with an autopen. 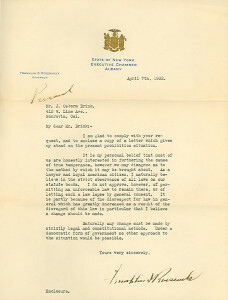 Kennedy, therefore, is much scarcer in autograph signatures, signed letters, and signed documents than his public career would indicate, and the demand for him has always been very strong. 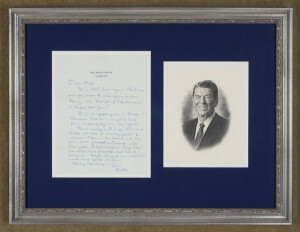 Ronald Reagan had Kennedy’s attitude toward not personally signing letters, and despite the many different positions that he held, including governor of California, is not at all common in autograph signatures, signed letters, and signed documents. 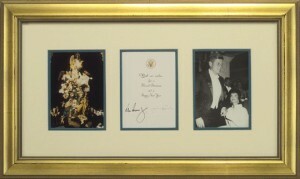 Please browse our selection of presidential autographs, signatures, signed letters, signed documents and memorabilia or you may search our entire inventory alphabetically, by name or by category.